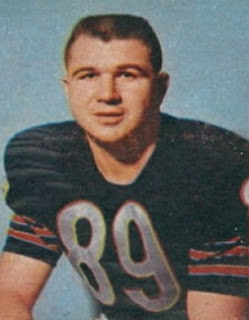 Ditka was a three-sport athlete in college (baseball and basketball were the others). He led the team in pass receiving three times and was a consensus first-team All-American as a senior. Ditka also played linebacker and defensive end with distinction and punted, setting the tone for his later pro career with his competitive fury and hard-nosed playing style as well as being a skillful performer. He was chosen by the Bears with the fifth overall pick in the first round of the 1961 NFL draft (he was chosen by the Houston Oilers of the AFL, also in the first round) and quickly became a key player on offense at tight end with his ability as a receiver as well as blocker. He caught 56 passes for 1076 yards (19.2 avg.) and 12 touchdowns in ’61 and, in addition to receiving Rookie of the Year honors from UPI and The Sporting News, was also a first-team All-NFL selection of NEA and The Sporting News and was chosen to the Pro Bowl. Bears went 9-5 to finish third in the NFL Western Conference. Ditka was selected to the Pro Bowl in each of the next three seasons and was a consensus first-team All-NFL selection in 1963, when the Bears won the NFL Championship, and ’64, when he caught a career-high 75 passes. He did much to define the newly-evolved position of tight end with his outstanding combination of skills. After a contract dispute fouled his relations with Chicago’s owner and head coach, George Halas, Ditka was traded to the Philadelphia Eagles in 1967, but accumulated wear-and-tear caused his production to drop off during two injury-plagued seasons. After catching 316 passes for 4503 yards and 34 TDs in six years with the Bears, he had just 39 receptions for 385 yards and four TDs in 20 games for the Eagles. Traded again to Dallas, Ditka split time in his last four seasons. He had 30 catches in 1971, a year in which he also caught a touchdown pass in a winning Super Bowl appearance. Ditka retired into coaching after the ’72 season, having caught a total of 427 passes for 5812 yards and 43 TDs. His greatest years came with the Bears, where he was a consensus first-team All-NFL selection twice, received at least second-team recognition after four other seasons, and was named to the Pro Bowl five straight times. He later became head coach of the Bears, leading them to a NFL title in 1985, and also was head coach of the Saints. Ditka’s #89 was retired by the Bears and he was inducted into the Pro Football Hall of Fame, Class of 1988.